Megan Levens and I were on the Weird Girls video cast with Danni Danger discussing all of our books. You can now grab Ares & Aphrodite chapter 3 from Comixology. Preview gallery below. Thought, technically, it's chapters 5 and 6, since the digital versions have two chapters each. With their own special titles, even. Don't forget to tell you favorite retailer to order you the print edition in April. Details here. Megan's first issue of Buffy the Vampire Slayer, Season 10 also goes on sale tomorrow from Dark Horse Comics. You can see a full preview at Comic Book Resources, ut here is a quick tease. Dark Horse has released details of their April titles. Click through the gallery to see all stages of the cover. And how about this sneak peek at #4 pencils that Joëlle tweeted out? * Exit Marrakech, a lop-sided coming-of-age story from Germany that's helped out by excellent performances. * Inherent Vice, the deranged Thomas Pynchon adaptation from Paul Thomas Anderson. This weekend in Portland, you can also catch Pedro Almodovar's fantastic Women on the Verge of a Nervous Breakdown. And Thursday, there is a premiere screening of a new documentary, Arresting Power: Resisting Police Violence in Portland, Oregon. I also reviewed the DVD for The Legend of Korra: Book 3 - Change. Shame the show only got one more season after this, it's really hitting its stride. I'm feeling pretty overwhelmed by the positive response to Lady Killer. It's starting to feel a little ludicrous how long the list of reviews is becoming. I've never experienced such a stupendous amount of buzz around a title...and I've had some pretty good buzz. Not complaining, mind you. This is a good problem to have. If you liked the first issue, now is a good time to let your comics retailer know. Lady Killer #2 is on its way to the printer, and I believe the print run will be set soon. Make sure you tell them you want them to order all the issues for you. Final Order Cut-Off for the second one is this coming Monday, January 12. And if you want a sneak peek of #2, Broken Frontier has an exclusive pair of pages in their new interview with Joëlle and I. * Broken Frontier, who already gave us a great slot in their advance picks, now gives us a full review. This first issue throws us right into the middle of the mystery of Josie Schuller, housewife and professional killer, showing just enough about her and establishing the conflicts which will presumably serve as the main source of tension throughout the series (i.e., the balance between Josie's hidden life and her more public one, and the potential problem her mother-in-law may be). One issue in and Josie is a compelling, complex character. Throwback Thursday: The first drawing of Josie in her Kitty Kat Club costume. * The 10 Spot ranks us as one of their 10s of the week. * Comic Vine also gives us a perfect score: 5 for 5. There are times you need to simply try a brand new comic. LADY KILLER needs to be that comic. With a strange mix of a 1960s wholesome vibe and a some serious violence, this is a refreshing book that gives you something delightfully different. Overall this is a miniseries that feels like it has some teeth, the visuals cast and plot all work well together and the creative team feel like they have a handle on the cadence of the story. If you enjoy undercover assassin stories then this will be for you, as for me I’m already caught in the Lady-killers web. I've been a huge fan of Jones ever since "12 Reasons Why I Love Her," but I feel like she's upped her game here. The art has the same characteristics of her earlier works -- clean, carefully composed characters -- but there are also some differences; the art in general feels a little more fluid, the inks a little slick. In many ways, it reminds me a lot of Paul Pope, whose art always feels like it's going to slide off of the page, but with a tiny bit more self-control imposed by Jones. Jones also does an amazing job of building a fully-realized world through the art. The clothing choices instantly plunge your mindset into the past, and that's before you add in the backgrounds. Everything from wallpaper to home appliances is deliberately chosen to root this book in a specific time period, and it's all meticulously drawn. Man I love this artwork. I really do. Joelle Jones is brilliant here with this nod at 1950's magazine advertising. Her previous work includes Helheim, The Adventures of Superman, Doctor Horrible, Creepy Comics, Ultimate Spiderman, and the New York Times to name a few. The ink splattered pages subconsciously projects grit into your mind. The action panels are terrifyingly realistic with confrontational character poses that puts you in both in the perspective of the killer and then also the victim. With sensational colorist Laura Allred in her corner, this series deserves some serious awards. Finally, thanks to everyone who came out to our party last night. Things from Another World really put on a great event, and so many people dressed up, it was great. Here's a photo of Joëlel and I at the store. Tags lady killer, comic reviews, comic books, Dark Horse Comics, joëlle jones, Laura Allred, Crank! On sale today is the digital-only The Double Life of Miranda Turner #5. If you haven't tried the book yet, entry is cheap. You can get the whole series so far for just under $5. Or you can just jump in now. Because that's what Steve Strout did. Here is a preview of the book's opening. Just click on the images to scroll through the gallery. Ares & Aphrodite debuted today on Comixology. You can get the first installment and sign up for a subscription right here. The full print version is going to follow in April. Diamond has details. It has some extra features, including a small sketchbook section, an afterword by Sequential Crush's Jacque Nodell, and the "Two Wheels, Two Feet" short story that Megan Levens and I did for Double Feature a couple of years ago. Here is a short preview. Click on the image to scroll through. Portland, OR (January 6th, 2015) – Oni Press is pleased to announce the launch of Jamie S. Rich & Megan Levens’ newest graphic novel, ARES & APHRODITE, the first chapter of which is now available at ComiXology and Madefire! ARES & APHRODITE is the second collaboration between Levens and Rich, following 2014’s MADAME FRANKENSTEIN, and will be split up into weekly chapters, released every Tuesday for $1.99. There will be six chapters of ARES & APHRODITE in all, finishing up on February 10th—just in time for Valentine’s Day! 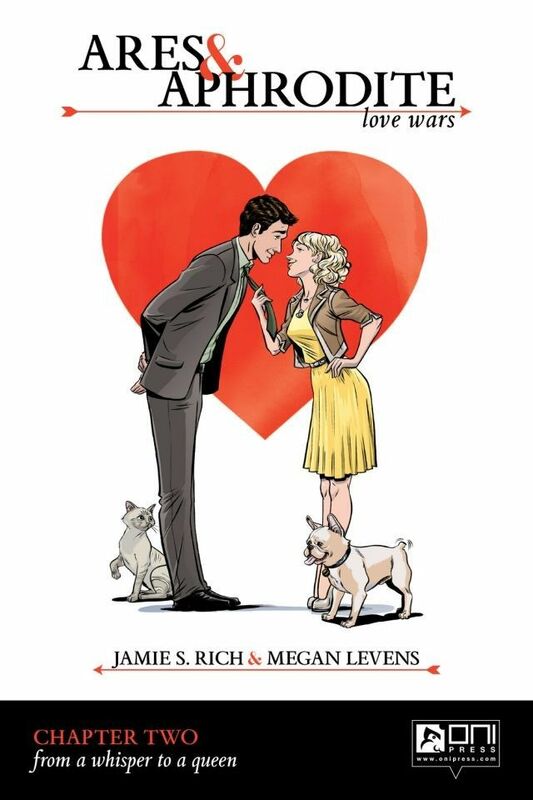 ARES & APHRODITE follows the exploits of divorce lawyer Will Ares and wedding planner Gigi Averelle. Under normal circumstances, they’d probably never meet, but their respective clients are getting married! Set against the beautiful and duplicitous backdrop of Hollywood, this romantic comedy is sure to satisfy even the most bitter of hearts. Intrigued? Readers can click HERE to get Chapter 1 of ARES & APHRODITE from ComiXology, or head over to MADEFIRE.COM for the first installment! Current Soundtrack: Charli XCX, "Gold Coins;" Rita Ora, "Grateful"
Tags Ares & Aphrodite, comic books, comixology, oni press, Megan Levens, Crank! Honorable Mention: Both Oasis and Duran Duran were in my top 10, but since neither released new music this year (unless you count the Oasis reissues, which was certainly the reissue project of 2014, and why the band got heavy rotation), I took them off the list. Indeed, Lily Allen earned her Sheezus title this year. I listened to her nonstop for the first half of 2014, and she also gave one of the only concerts I intended. The numbers below were manipulated a bit so she only shows up in three slots, or it would be half her on this list. Overall, women dominated pop music, and offered a variety. Lana Del Rey and Charli XCX and Jenny Lewis and Azealia Banks and Taylor Swift...all different styles, all landing on my playlists for 2014 (even if they don't all make this list). We are just a week and a half out from Lady Killer's debut, and more advance word is rolling in. Joëlle and I did one more interview over at Big Comic Page. We also have some pretty positive advance reviews. The combination of writing and artwork accomplish the most important thing; making you interested in the characters. They seemed alive with their facial expression and smartly drawn backgrounds bringing the characters to the forefront even more. The familiar setting for the most part becomes forgotten and pages can go by while you get involved with what’s happening in the panels before your eyes. We continue to update our Tumblr, and also don't forget to come to our January 7 release party at Things from Another World if you are in the Portland area. Joëlle, Laura, and I will all be in attendance, and I am putting together an extensive playlist for the event. You can also meet Joëlle at Wizard World Portland on January 23-25 and at Challengers Comics in Chicago on March 20. Original Lady Killer art will be on display at Challengers. Then we we will both be at Emerald City Comic Con on March 27-29, signing with Dark Horse and probably Oni Press. I'll maybe make an appearance at Image Comics' booth, and also be hanging around Megan Levens' table. I'll post a full schedule once I have it. Image Comics has released their official press release for the trade paperback of Madame Frankenstein. See a longer preview at What'cha Reading. Dan Christensen's Archer Coe Christmas card. Archer will be back! Just you wait! * Big Eyes, a decent effort from Tim Burton, but his Margaret Keane biopic still falls well short of being a masterpiece. * The Imitation Game, the story of computer pioneer Alan Turing, with his tragic life being portrayed by Benedict Cumberbatch. * Inside the Mind of Leondardo 3D, an upgraded TV documentary with Peter Capaldi featured in dramatizations of Leondardo Da Vinci's journals. * Into the Woods, Disney's adaptation of the Sondheim musical mostly entertains. * Stray Dogs, a remarkable new Taiwanese drama from the director of Good Bye, Dragon Inn. Or if you feel like watching one of the most legendary bombs on Blu-ray, Otto Preminger's 1968 stinker Skidoo, has somehow gotten the high-def treatment. Current Soundtrack: Lana Del Rey, "Big Eyes/I Can Fly"